With 2048 levels of pressure sensitivity, the drawing pen can sense tiny pressure from light hand. Let users work easily and comfortably like the feel of traditional painting, smooth drawing and brush stroke effects by pressing harder or softer with the digital Pen. Active working area maps computer screen automatically by adjustment on driver configuration interface. Multiple monitors function is supported to meet various needs of different users. Express Keys are programmable as function keys, keyboard shortcuts, mouse clicks, launching applications, and pop-up menus. Layout of Programmed Express Keys can be displayed on screen by pressing Key Display Button. Ambidextrous & Switchable Design is adorable design for both of left handed and right handed user. 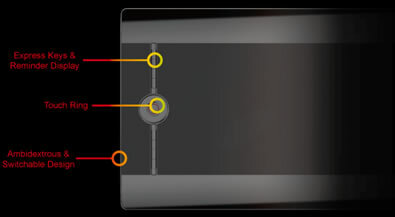 Users may find comfortable position by simply switching the tablet to right or left. User may zoom, scroll, rotate canvas in applications by using finger sensitive Touch Ring. 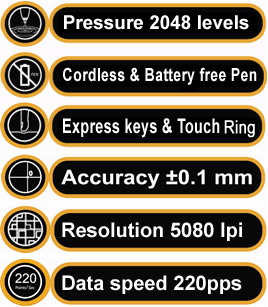 Featuring Hanvon’s Pressure Sensitive Technology, the stylus senses tiny pressure from Pen tip. Pressure Sensitive Eraser on stylus brings convenient tool to modify art work. Two programmable switches on pen body enable user to customize the function of switches according to user’s habits.